While leftists have plenty of legitimate ideological qualms with the legislation that Nancy Pelosi has passed (like the PAYGO law, which by her own admission is a weapon that the Trump Administration could wield against Democratic legislation…unless we pass a PAYGO rule that allows Pelosi to bypass the law—I know, I’m confused too—Washington is a really, really stupid place), we cannot deny her effectiveness at getting under the skin of GOPers. Given that Republicans still control both the upper chamber of congress and the presidency (not to mention the Supreme Court), any hopes of real liberal legislation being passed are about as realistic as the Grand Marshal of the Supreme Court sentencing Steve Bannon to death. The job of the Democratic Party over the next two years is the same as Tony Stark’s in the final fight scene of the original Ironman: rip out as much of the GOP’s body armor as you can, all while stalling for reinforcements (2020) to prepare a much more powerful weapon to defeat the bad guy. Troll them into self-inflicted wounds. Issue so many subpoenas to Trump’s de facto criminal enterprise that the stack of them stretches to the moon and back. Remove symbolic moments the GOP uses to spread their propaganda. Just straight up mess with them and back them into corners. The next two years are all about going after Trump and the GOP, and exposing them as the unserious hacks this entire party has been since at least Nixon. Sadly, given the security concerns and unless the government re-opens this week, I suggest that we work together to determine another suitable date after government has re-opened for this address or for you to consider delivering your State of the Union address in writing to the Congress on January 29th. To understand what an amazing move this is, you must put yourself inside the turgid, half-eaten Big Mac that the President of the United States calls a brain. All you know about the world is what you see on cable news. Fox News is good, CNN is fake news, and MSNBC is communist. The major networks are fake news too, but they also just heeled to your demands to interrupt their broadcasts for nine minutes so you could rant your usual bigoted immigration rant. No matter what happens, you know that you will appear on cable news, which is also the only way you are capable of feeling happiness—or really anything at all. Hell, you’re shutting down the government right now because the angry people on cable news told you to! We need a wall or you’re not getting reelected, so it’s time to leverage the government to get what you need. When you give your State of the Union in a couple weeks, you will surely…wait, what???? WHERE’S MY TWITTER!?!?!!? KELLYANNE!! PHONE! NOW! Trump doesn’t care about government workers not getting paid. He doesn’t care about jeopardizing our national security. He doesn’t even care about the damage it’s doing to the economy. He only cares about himself, and he cares about all those other things only insofar as they can directly help him. Taking away his signature address where he gets to pretend that he’s a fancy lad is one of the best moves the Democrats could take to end this shutdown. Nancy Pelosi knows exactly what moves the needle in Trump’s narrow universe, and she’s not afraid to go after what he holds most dear: his time playing TV president. Trump is a product of the last 40 years of political media, where everything is a horse race and policy doesn’t matter much outside how it impacts the horse race. Charisma defines every fight, and everything is a conflict. He knows he’s losing this wall gambit right now, and the only move he understands in this kind of spot is to make a lot of noise and throw a lot of punches. That kind of a fight favors the Democrats given that they have real power and no way to use it to pass legislation—hence they have no incentive to cooperate (*looks directly at Chuck Schumer*)—and we’re seeing this play out with Pelosi using some of this power to tie Trump’s ability to make noise to the government staying open. There really isn’t much more she could have done in this spot to directly hurt Trump, short of forcing the IRS to give her his tax returns (something that she now has the power to do, and has already said she will do). Ideology aside, Nancy Pelosi is one of the most effective Democratic politicians of the 20th and 21st centuries, and there are few people in Washington who better understand the inner workings of both congress and our corrupt capital than Pelosi. Given the Democrats’ inability to pass any major legislation, having someone who understands how to fight Trump and the GOP is a far bigger priority than ideology (to a point—obviously if the Democrats appointed Paul Ryan as Speaker, ideology would then matter more than specific legislative knowledge). The year 2020 is when the policy wars will begin. As a leftist who does not completely trust Nancy Pelosi, I can safely say that there is no other Democrat that I would want doing her job right now (other than maybe the Twitter Heavyweight Champion of the world). The next two years of Democratic rule should be defined by doing the basic things that congress needs to do in order to keep the government running, subpoenaing as many Trump-adjacent lemmings as feasible, and utilizing the various powers of the House to piss Trump off—because he has proven that his only actual talent is making a bad situation worse for himself. 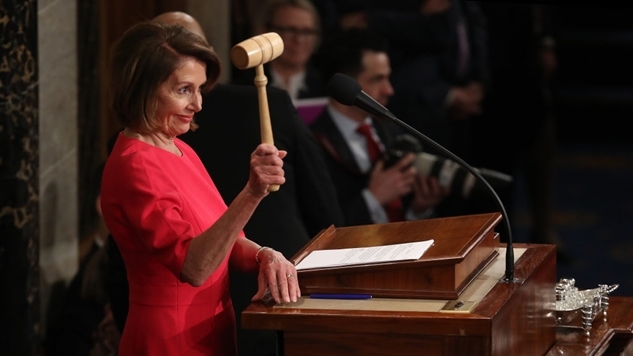 Speaker Nancy Pelosi of the United States House of Representatives is a bad situation for President Trump, and she just fired the first shot in this war, taking away one of his favorite toys. Nancy Pelosi knows how to play Trump’s game, and she plays it better than he does. Now we just have to wait and see how Trump will inevitably aid Pelosi’s quest to undercut our criminal president and try to set up an overwhelming Democratic victory for 2020.